We feature an array of indoor spaces suitable for weddings, corporate functions and private events. Our customizable packages allow you to rent one space, multiple spaces or the whole museum. Available during the day or after hours, the Special Event Center is perfect for events for 20-300 people. With 4,000 sq. ft., multiple AV capabilities, a private parking entrance and lobby, this space is ideal for your next corporate or social event. Tucked away on a quiet floor, the Regions Room is the solution for your next business meeting, small luncheon, baby shower or intimate dinner. Perfect for groups of 40 or less, this space is available day or night. For and unique and distinctive feel for your next reception, banquet or gala, the City Gallery offers an alternative to the traditional. Available for after-hours events, The City Gallery, with its large digital globe and intimate layout, will offer your guests an event to marvel at. With seating for 280, your next film presentation, business meeting or private IMAX screening will WOW your guests. Available after-hours, the IMAX Dome Theater boasts the world’s most advanced six-channel digital surround sound system and domed screen. 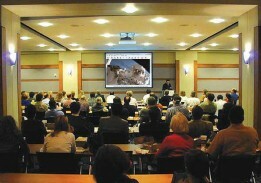 McWane Science Center offers multiple classroom options for your conference or meeting break-out rooms. Available during the day and at night, the classrooms are perfect for 5-50 people. For a truly unique event, rent one or all 4 of McWane’s interactive adventure halls for your next after-hours employee appreciation day or wedding reception. Don’t see a space that fits your needs? Call our Special Events team at 205.714.8363 and they’ll be happy to discuss other options.